So the lead up to Christmas was the usual (for me) hectic stuff – too busy at work, but some good Christmassy parties there too. 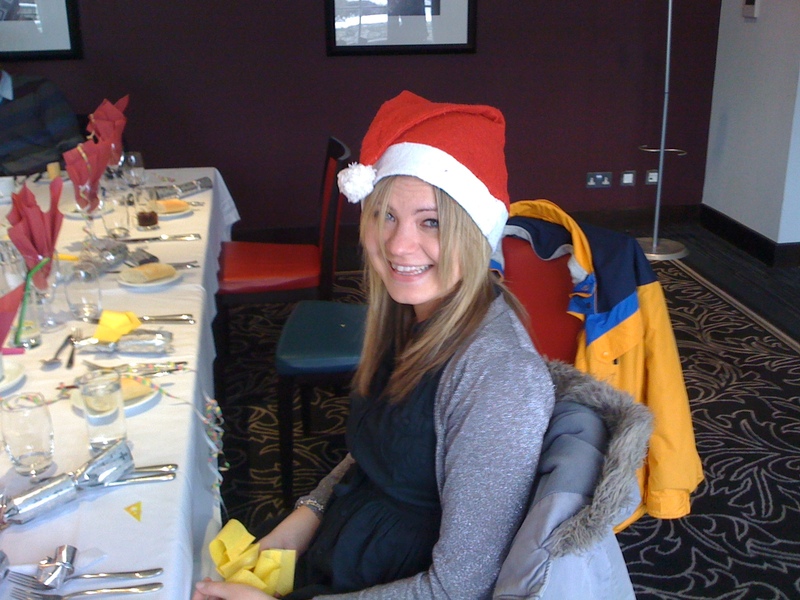 We had our works one the day before Christmas Eve, and I thought that I would give an honourable mention to Alice, who is pictured below, wearing my hat! "Do you think yellow suits me?......." 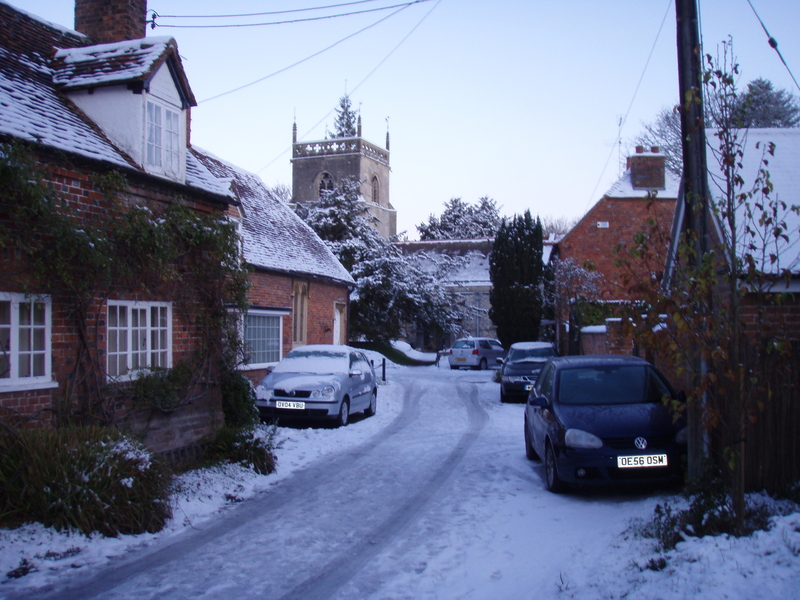 So anyway, up North I headed to my Dad’s on Christmas Eve, with a bit of a headache from the night before. 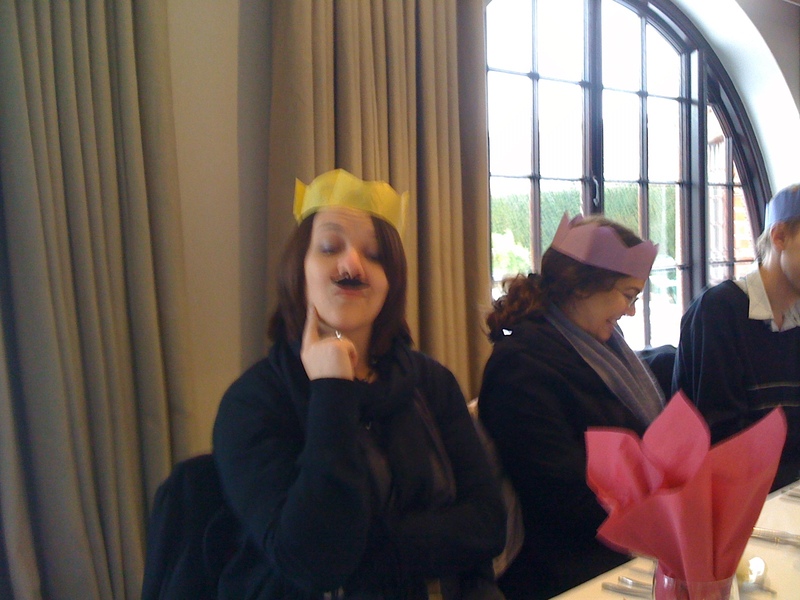 Had a nice lunch just before I went (thanks Claire:)), and then met my old school chums from what must be a lifetime ago in the pub that evening. I loved it, it was absolutely great, even if ‘The Mariner’ might not exactly be the most salubrious emporium in South Shields. Joe McElderry’s picture was on the wall though, and so that is OK with me. 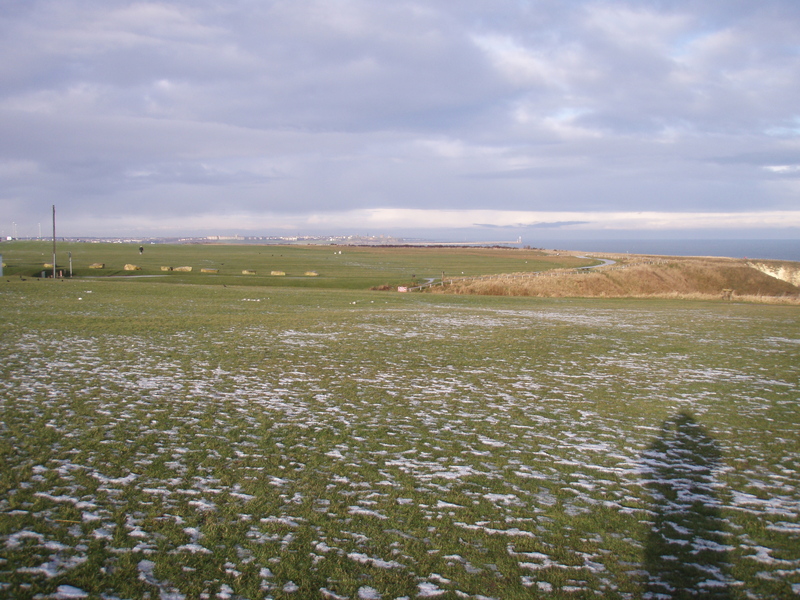 So anyway, once that Christmas Day was over with (oh yes and Boxing Day too), it seemed like a good walk was in order. Oh and before I get onto the walk I should say that the night before at John’s Mam and Dad’s house was just priceless – thank you John, I didn’t know that singing carols could be such good fun! 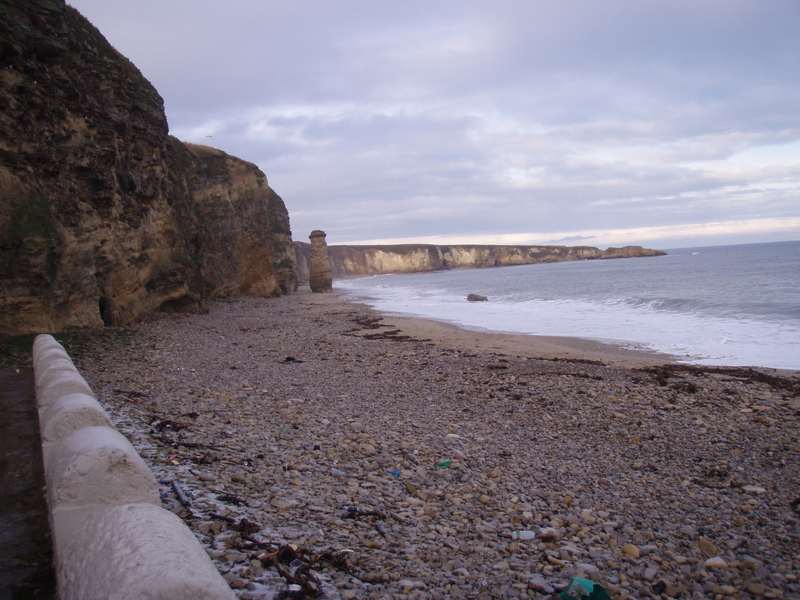 Down to the coast in South Shields then, and an 8.30 start on Sunday morning. Bugger me it was cold! 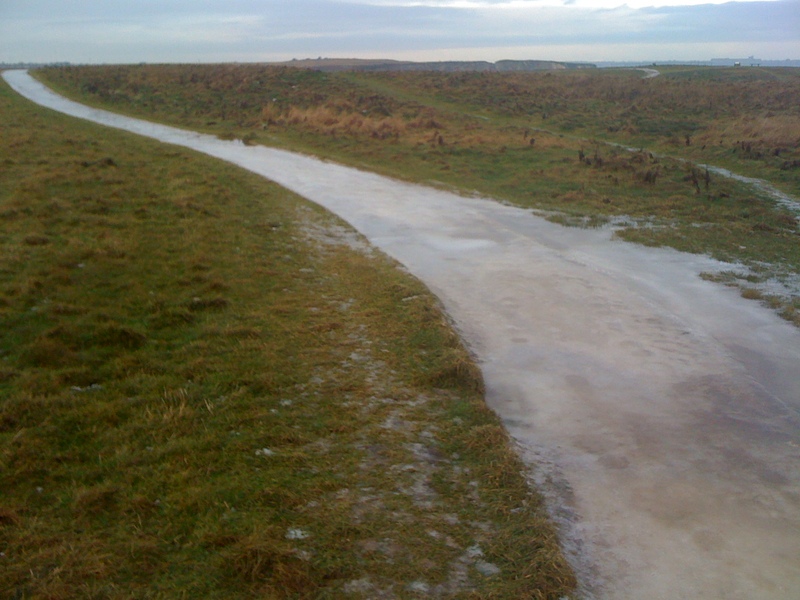 The path above, which leads down to the beach from the ‘Leas” at South Shields (a bit of history below from Wikipedia:) was so iced up that I didn’t even dare stand on it. The south end of 'Frenchman's Bay' looking towards Shields pier. 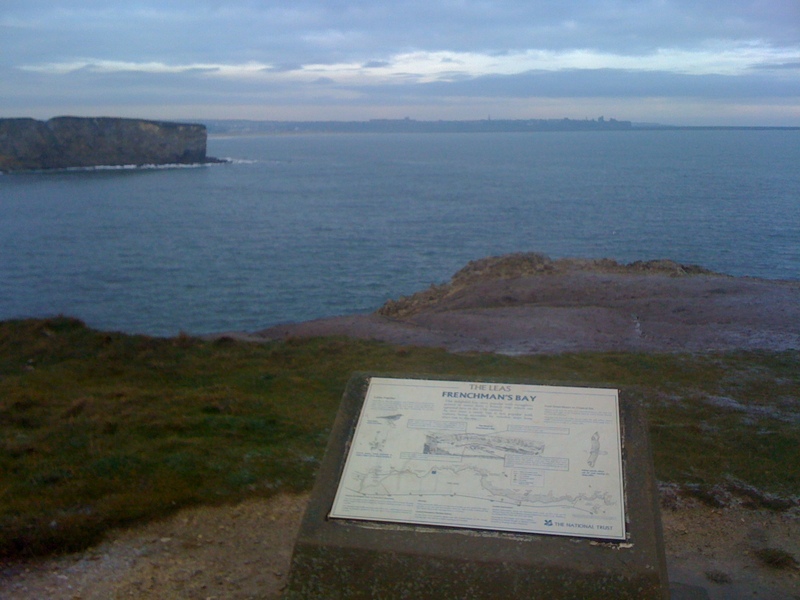 This is ‘Frenchman’s Bay’, taken from the clifftops. The name I think came from a wrecked French fishing/pirate boat way back in time. Oh and I resolve myself to get a better camera before Kilimanjaro – these are all taken from my iPhone, and whilst I have a ‘not bad’ camera, it is also ‘not good’ – it takes great pictures underwater (as it is an underwater camera), but on dry land it is disappointing, so that is one for the list. 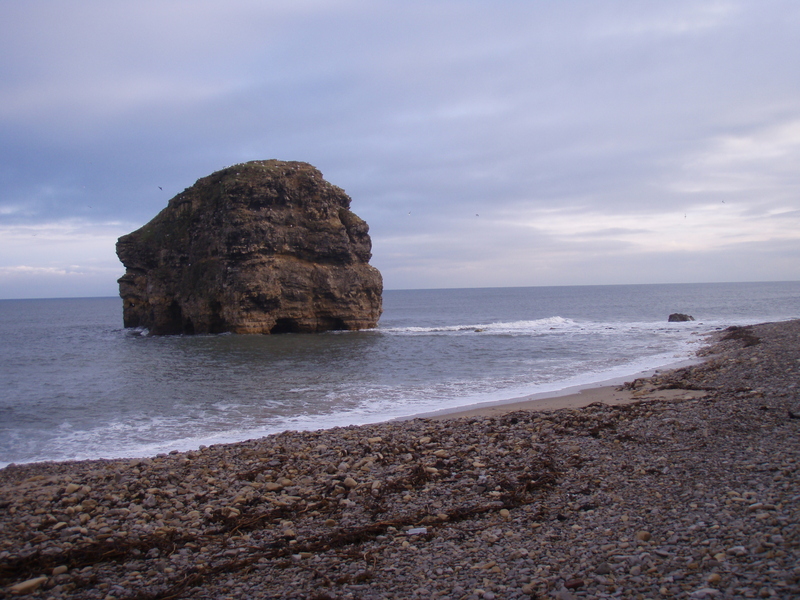 "Marsden Rock", from just beyond the "Grotto"
Wonder why there is no-one sunbathing? So then finally back to those steps. As I had done a few miles already, I had the choice of two options – I could get the lift up, or could walk. Well no contest is there? 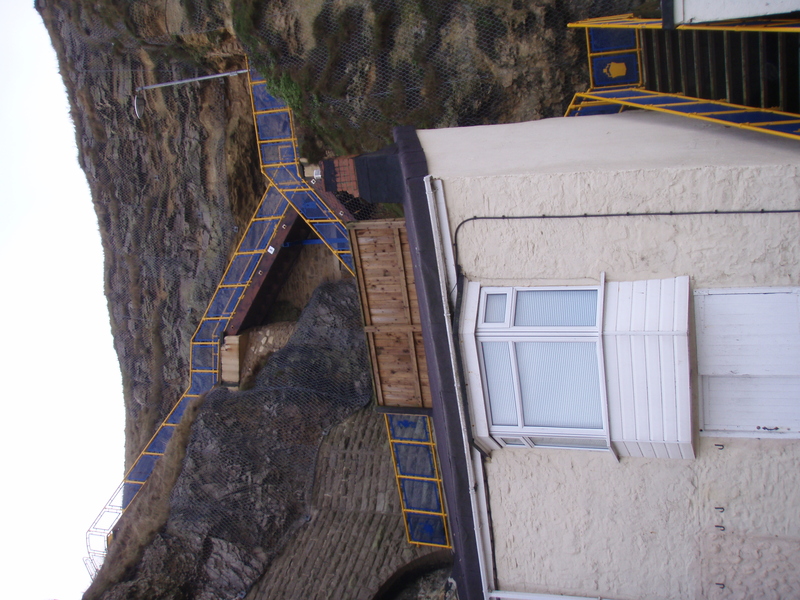 Especially as going to the lift would have involved going into the pub at the bottom first! Actually, I surprised myself (twice:)), by walking up (all 123 of them), and then walking back down and then back up again! So that would be about 500 up and down steps then. I can only say that I was knackered completely by the time I got to the top for the final time. 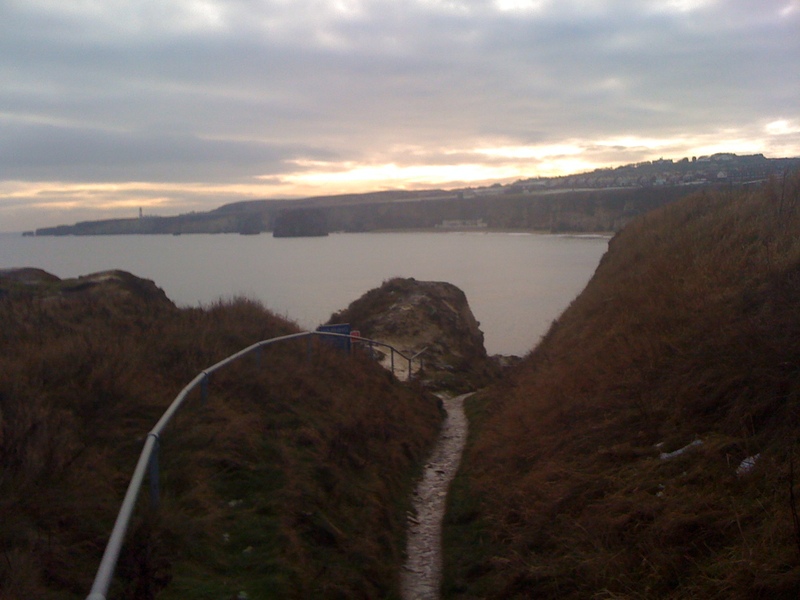 So finally here is a picture taken from the top at Marsden, looking back north this time towards the pier at South Shields. 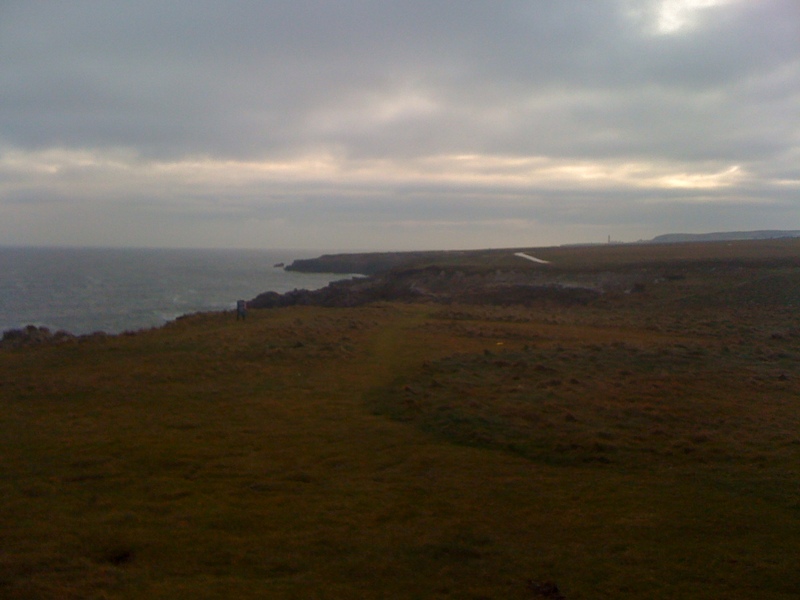 It was still very cold, but the walk had certainly done me good. Time for some mince pies, Christmas pudding, and some (even better!) Christmas beer! Oh no, they closed the gym! Well would you believe it? When the festive season is in total full swing, you just need extra motivation to force yourself to the gym. In my case I most certainly don’t need an excuse like “it’s the festive season”, but it is a great one right now, so I’m having it. It has also recently been a bit less convenient to use the gym, as they are in the midst of a refurb, and are doing various rooms one at a time so as to keep the place open and going. For the last two weeks the changing rooms have been closed, so you have had to use the swimming pool area to get changed instead – not the greatest hardship in the world, but it has meant that (as the swimming pool is small) there isn’t always a locker. This means you have to change and then go back outside to your car with your bag, in your shorts, when it is -4 outside, which isn’t funny. Anyway, having been out every night this week (did I tell you that it is the festive season:)), I decided that yesterday, Saturday, I should go. So having battled with the crowds briefly for a few Christmas pressies, I turn up, and the car park is nicely quiet. In fact there are about six cars there, and I smile and think of everyone battling the Christmas hordes, and march in thinking that I will have all of the gym equipment to myself. I even smile and think I can fall off the treadmill again without anyone laughing at me. I get to the reception desk, and the girl there (who seems to know everyone who comes in, apart from me – maybe I should go more often?) tells me that unfortunately the gym is closed for refurbishment until the 4th January. What!! She does tell me that the pool is open, but as I have no swimming stuff that is about as much use to me as a chocolate firegard, and so I turn around and go back home. 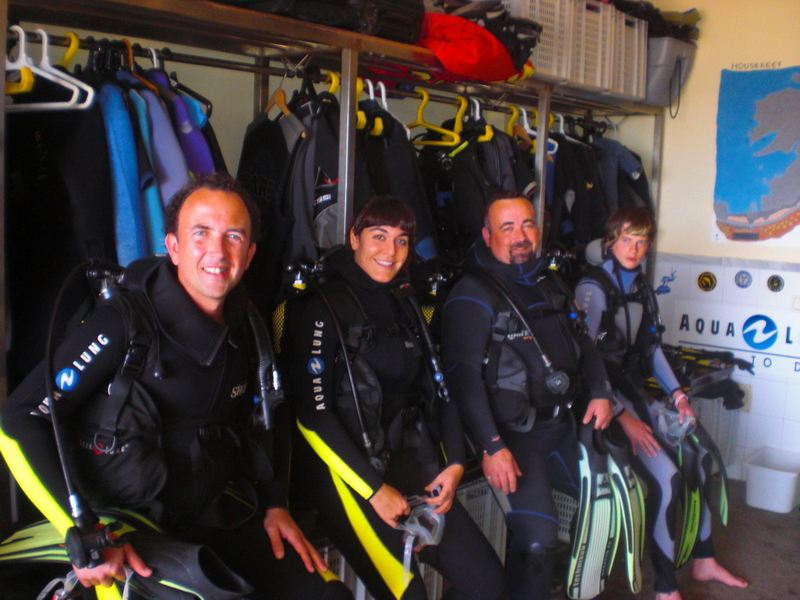 I had no idea that you could go Scuba diving on Lanzarote. Did you? Having been to The Maldives a couple of times and snorkelled, I have always fancied diving, but just never done it for a host of reasons – fear and cost being just two! So it was the second last day of my holiday and I am lying with my book (“A Thousand Spendid Suns” by Khaled Hosseini – outstanding by the way) by the pool, and just contemplating life’s rich tapestries, as it were. Now often during the day you would hear some of the ‘animations’ team walking round the hotel pool trying to drum up some people for activities. You would therefore hear “boules in 10 minutes!”, or “Sangria demonstration in 10 minutes!”, or even “putting competition in 10 minutes!”, whereby you would then see some of the residents trundle off for sundry events. I had switched off to all of these cries, as nothing sounded terribly entertaining to me, when all of a sudden I hear “Scuba diving in 10 minutes!”. I sort of did a double take and cannot think that I have heard correctly, when I look up and see a girl wearing a “Dive Centre Lanzarote” shirt, and think that maybe this is real after all. So I approach her with a strange expression on my face and ask her if she was serious. As she was holding an oxygen cylinder, and sundry other diving equipment she looked at me back with a “do I look like I’m serious?” expression, and so I guessed that she was. So to cut a long story short (why do I always do or say that? ), within ten minutes I am in the hotel pool with full diving gear on, and trying desperately to breathe properly through the mask. It is harder than it looks. Breathing itself is OK, but what I didn’t realise is that you have to totally empty your lungs in order to descend, and that is a leap of faith. It is so unnatural, as you think you want to fill your lungs with all the stuff that the tank gives you, so as not to, well, die, but that does not get you anywhere I can assure you. You just float at the surface like a piece of cork, it is strange for sure. After about 20 minutes or so of very patient teaching by the instructor (I would have given up on me, I really wasn’t getting it at all), I eventually manage it, I get going down, empty my lungs (I mean you have to breathe out for at least a count of eight, and that goes against everything that you feel like doing when you are underwater – you either want to hold your breath or breathe in), and I am at the bottom of the pool. Wow! When the penny drops it is fantastic – you just need to be really calm. Like caaaaaalllllllllmmmmmmmmmmmmmmmm, with capital letters and things. So having ‘got it’, Elsa (she’s the instructor) asks if would like to dive in the Atlantic the next day. I look at her like she has just asked me if I want sexual favours or something (she’s very nice too:)) – and I say “yes”. The word “yes” comes out of my mouth like “that is the most stupid question I have ever been asked, of course I want to!”. And so the next day I am sat with three other virgin divers, enlisted from other hotel pools like me, and we are being given diving instruction by Bart, a Dutch guy who will be our diving buddy on the south coast of the island. Here is a picture of us in the room beforehand having got kitted up and after our classroom training. Do I look scared? I should do, I was! The girl next to me has a very small head, don’t you think? We had been taught in fairly scary fashion all about equalisation (that’s your ears and sinus passages etc), and also the lungs, and not having them overinflate when you ascend, and how bars of pressure work etc. Then we had the stuff about what hand signals we needed. The instruction was very good indeed. 45 minutes later we were kitted up and ready for the ocean as seen above. To start with, the same thing affected me as the day before. I have a 10kg lead belt round my waist, and rocks stuffed into the pack on my back, and the cylinder must weigh a bunch (and so do I), but still I cannot sink. Bart has to get a bit in my face, and show me again how to not breathe in, at all, and in fact to only breathe out, for as long as I can. But this is the Atlantic Ocean, and a bit scarier than a four foot deep swimming pool! I mean it is deep, and big, and there are things down there!! Anyway, I get it, and go for it, and I am away – I am down! It is incredible! We spend probably 45 minutes altogether under water, never surfacing during that time at all. That feels weird, but once I am breathing properly, I never have to think about it again. It is a fantastic feeling, believe me. Fantastic! The fish are a lot more plentiful than I expect also. There are lots of bream, fairly colourful, and lots of urchins and anemones and smaller fish, but pretty too. I am amazed. The guys from the diving school are right by you at all times, and they take plenty of pictures too, which are of course available for a fee on disc afterwards. Sold! Sadly I am having problems getting some of the photos loaded from the disc at present, but here is one of them below – more to follow when I get the rest up and ready. We don’t go too deep, apparently it was about 7 or 8 metres, but it is enough. I resolve to more diving when I get the chance – maybe it’ll have to wait a while, but this for sure is a whole new world. I am hooked. 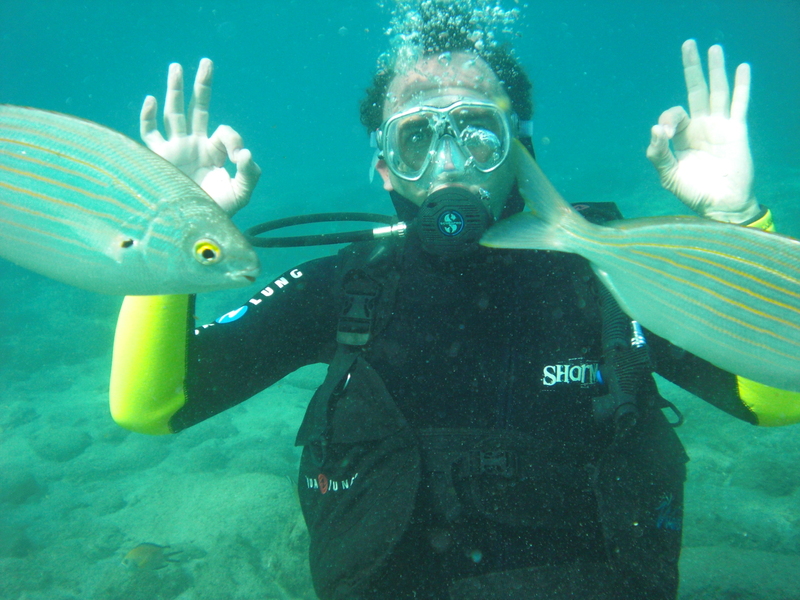 I am a diver!